These lists are a selection of plants from the National Garden for you to try in your own garden. Explore by category or scroll through and find a new plant to try. In 1986 President Ronald Reagan signed legislation creating the rose as the national floral emblem for the United States. Plans then got underway to find a site to showcase roses in the nation's capital. The U.S. Botanic Garden (USBG) was selected, and the National Garden was dedicated in 1995 to commemorate the 175th anniversary of the legislation creating the USBG. But it would take more than 10 years for it to be created. The National Garden opened on October 1, 2006, and its stewardship was turned over to the USBG. The garden educates visitors about the diversity of American plants and their importance to the environment; helps connect people to nature; and demonstrates the relationships between plants, water, and humans. 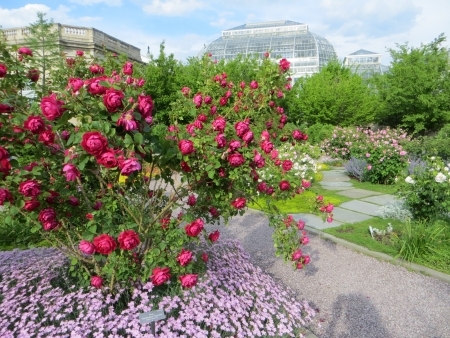 The National Garden was made possible by a successful collaboration between the U.S. Congress, the Joint Committee on the Library, the National Fund for the U.S. Botanic Garden, the U.S. Botanic Garden, and the Architect of the Capitol. The rose is America's national floral emblem, and it is a favorite flower and plant for many gardeners. Here are 10 of our favorite varieties. One of the few miniature roses showing very good disease resistance. Buds open to small, lightly scented greenish double flowers that age to white. Hardy, and good for containers. A wonderful groundcover featuring finely textured, glossy foliage studded with small, pale-pink semi-double flowers with a long blooming season. Nearly thornless, producing beautifully red new foliage and creamy yellow/pink flowers. Great for mixed borders with a nice repeat bloom in autumn. Prickly stems are beautifully burnished red in winter, while mildly fragrant, stunning pink double flowers emerge late spring through early autumn. Long-blooming, peach double flowers are richly fragrant and disease resistant. Reliably disease-resistant foliage with mildly fragrant, pearl-pink ruffled double petals that bloom over an extended flowering season. Tidy and manageable over a long blooming season. Produces delightful red new foliage and young stems that contrast nicely with lightly fragrant, small white double flowers. Loose, upright stems with clean foliage and spicy-scented, lavender-pink semi-double flowers bloom over a very long flowering season. Single flowers change from yellow to rose, making a whimsical display on this large, healthy, long-blooming shrub. This shrub rose features fully double, light yellow flowers emit a lightly spicy fragrance. Reliable, long blooming, and possessed of very good disease resistance. Water gardens can bring calming sounds and peaceful views. In containers or ponds, with plants that can vary from full sun to partial shade, there are many native plants to make your water garden shine. Yellow, club-like inflorescences rise in early spring followed by handsome blue-green leaves. Non-spreading and a great choice for small ponds. In summer, wands of inflated, spiny pale green fruit give this species another common name, mace sedge, because of their resemblance to medieval clubs. Semi-evergreen grassy leaves bring winter beauty. A summer beauty featuring tall leaves and stalks of lilac-blue flowers. Attractive to bees and butterflies, including the native bee Dufourea novae-angliae, for which it is the sole nectar source. Robust, arrow-shaped leaves are complemented by white flowers that bloom throughout summer. The common name is a nod to the edible underground tubers. Soft-pink spring flowers give way to showy red fruits ("hips") in fall and winter. Glorious red fall foliage on shiny mahogany twigs makes for an all-season beauty. Simple, elegant yellow flowers rise just above the water, complementing the floating, arrowhead-shaped leaves of this water lily relative. Purple spring growth is followed by fans of bright green leaves and graceful lilac-blue flowers. Related species I. versicolor (northern blue flag) and I. prismatica (slender blue iris) are equally lovely. Cultivated worldwide with many stunning hybrids, this American native species features large white or pink flowers that are spectacular in summer. A mid-summer showstopper with intensely red blooms, cardinal flower's nectar is a favorite of hummingbirds who pollinate the flowers while probing for food. Globes of white, fragrant flowers peak in June, attracting pollinators including Swallowtail butterflies. A large shrub, it is great for rain gardens due to its preference for average-to-wet soils. Plants are important sources of food and shelter for many birds, mammals, and insects. Here are 10 of our favorite native plants to help bring animals to your garden. Spring flowers supply nectar to early pollinators, and leaves are favored by many butterfly larvae including the beautiful Red-spotted Purple butterfly (Limenitis arthemis). Creatures great or small, feathered or furred favor the tasty fruit. Early summer white blooms teem with bees, followed by yellow-brown fruits in late summer and a long show of brilliant scarlet fall foliage. Hardy north of its native range in the southern United States. Extremely rare, this late season goldenrod provides nectar for a bevy of pollinators via wide plumes of golden flowers on red-purple stems. Oaks provide food for more butterfly and moth larvae than any other tree genus in North America, and there are oak species native to just about every climate and soil type. Showcasing tall spikes of golden flowers from mid-to-late summer, wild senna is popular with bumble bees and is an important larval host for Sulphur butterflies. A small tree with large leaves that bears the biggest edible fruit of any American native plant. For delicious and abundant fruit that is sought after by both humans and animals alike, plant two or more grafted cultivars because this tree is not self-fertile. Clusters of dusty-rose flowers highlight this pollinator magnet, which also serves as a good larval host for the Monarch butterfly. Soft-yellow autumn leaves make way for spectacular clustered purple fruits in autumn and winter that are relished by birds. In the winter season when resources are scarce, this holly's shiny red berries soften over the cold months and offer food to birds in need of a meal. A native host for Black Swallowtail butterfly larvae, golden Alexanders attract a bounty of pollinators with late spring golden flower clusters. Native wildflowers have evolved to thrive in a variety of local conditions: very hot, dry, humid, or wet. Here are 10 of our favorite native wildflowers to try in your garden. Tidy and compact this dry land species has lilac flowers, in autumn, sometimes called "frost flowers" for opening on chilly mornings. Crush its leaves to produce an earthy, spicy aroma. Slower to spread than other goldenrod species, this goldenrod thrives in sun and well-drained soils. Beyond being beautiful, its glossy, licorice-scented leaves are also used in herbal teas. For a pop of white-to-pink in early spring, seek out this slowly spreading, evergreen groundcover. Its flowers sometimes open earlier, bringing a splash of color during mild winter weather. Rosettes of gray-green foliage highlight greenish-white globes of summer flowers that are a favorite of many pollinators. Attractive clumps of blue-green foliage on graceful stems yield abundant late-summer flowers featuring violet-blue rays with vibrant yellow centers. Drought-tolerant with clusters of delightfully bright orange flowers that bloom from late spring to early autumn and attract butterflies. The plant is also a host for Monarch butterfly larvae. Ice-blue flowers in spring and bright yellow foliage in autumn make this neatly clumping plant a knockout. For dry, sandy soils, try the finer-textured A. ciliata (fringed bluestar). Tiny creeper that naturally thrives in dry, wooded environments and impresses with a profusion of blue, lilac, or lavender spring flowers. Shrubby, shade-loving perennial features reddish-purple fall foliage and delicate, starry white spring flowers. Late season golden blooms are accented against dark green leaves on this beautiful perennial. Shrubs can form a foundation for a garden. Some shrubs are great for their foliage, while others provide additional flowers to the garden. Here are 10 of our favorite native shrubs to try in your garden. Pale-green foliage abounds on this large evergreen that is happiest in poor soils and needs little attention. The crushed leaves offer a warm scent similar to eucalyptus, and female specimens have gray-blue, wax-coated berries. Clusters of flat-topped white blooms transition to colorfully ripening fruits through late summer into autumn. Smooth and shiny burgundy foliage joins this autumnal display. This slow-growing dwarf ornamental is amenable to a variety of garden environments, featuring white bottlebrush blooms in spring and colorful foliage in autumn. White-to-pink spikes of small, sweetly-scented summer flowers make way for dark brown seed capsules that can last until winter. Popular with butterflies and bees alike. Though quite tall in the wild, this cultivar has a small stature and abundant shiny, red fruit that persist throughout winter. Bright green leaves showcase round, white clusters of flowers in the late summer and early spring. Mature branches feature peeling bark, showcasing layers of red-to-light brown inner bark, most visible and vibrant during the winter. A profusion of bright gold summer flowers sprinkled across a palate of dark green leaves make this compact and soil-adaptable plant a fine addition to any landscape. An abundance of sweet-scented spring flowers and a tolerance for moist or dry environments make this deciduous native a great choice for Southeastern and Mid-Atlantic gardens. This small shrub features white blooms in spring and fixes its own nitrogen, making fertilizer unnecessary. The leaves can be used to brew a caffeine-free herbal tea. Slow-spreading, attractive evergreen groundcover that comes alive with a scattering of lovely red berries in autumn and winter. Trees can provide vertical height, shade, and sources of food and shelter for people and critters. Here are 10 of our favorite large trees to bring plentiful shade to your garden. Star of urban environments with beautiful fall color and spiny, spherical fruits in fall and winter. Cultivars offer variety in leaf forms and fruitlessness. Glossy, evergreen leaves with velvety, brown undersides highlight this southern belle's spectacular plate-sized white summer flowers and cone-like, red-seeded fruits in fall and winter. Finely textured, bright green foliage fades to a decadent orange-brown in the autumn. This conical conifer can grow in the toughest of soil conditions and has the potential to form "knees." Medium height, a rounded crown, beautiful flaking bark, and tolerance of urban soils make this a great tree for space-limited landscapes. Prized red fall foliage on a majestic branching pattern, this beekeeper favorite is the nectar source for tasty tupelo honey. Eye-catching long needles make a bold statement for this evergreen conifer. Not ideal for colder, snowier climates, it thrives in warmer areas. Somewhat weeping branches bear white summer flowers in elegant lily-of-the-valley-like sprays from which bees make sourwood honey.Yellow-to-maroon fall foliage is spectacular. Sharp, pointy green leaves and the bright red berries of female trees are a familiar sight for many tree lovers. Tough as nails, this evergreen develops into a large pyramidal tree in full sun. Tough and fast growing, this evergreen has fragrent cedar-scented wood. Female trees bear waxy, blue cones relished by cedar waxwings and other birds. Short cultivars may be more suitable for home gardens. Late spring blooms, beautiful fall foliage, and bark reminiscent of alligator skin lend interest in all seasons. The attractive, edible fruit is sweet and aromatic when fully ripe. Sometimes you want the look and benefits of a tree, but don't have a lot of space. These 10 favorite small trees will retain their size, perfect for compact gardens. Light green, mitten-shaped leaves change from yellow to orange to brilliant red in autumn. Greenish-yellow female flowers produce draping clusters of striking red and black fruits. Large early-spring leaves are quickly followed by mid-spring showy spikes of deep red flowers that attract hummingbirds. Buckeyes are cluster-forming and can be grown as a screen. Beautiful white flowers in early spring are followed by delicious red-to-dark-purple, edible fruits in late spring or early summer. Reddish fall foliage is a delight, and seeds are devoured by birds and small mammals. Smooth, gray bark on sinewy trunks imparts another common name, musclewood. Revered for white-to-pink, flower-like springtime bracts, the open-branching, checkered bark and attractive, red-tinged autumn foliage are also stunning. An elegant blush of edible spring flowers along the trunk and branches is followed by delicate, heart-shaped leaves emerging as the legume fruits mature. Cup-shaped, creamy-white flowers nicely contrast against matte-green leaves in the early summer. Come autumn, cone-like fruits with exposed red seeds put on a beautiful show. Spectacular autumnal foliage and its easy care make this tree a delight for any garden. When mature, its smooth, pale bark earns its common name. A pleasantly rounded canopy, wispy white mid-summer blooms, and suspended purple autumn fruits highlight this adaptable and tough urban garden selection. Impressive orange-brown bark sloughs away to reveal light brown inner bark, adding a pop of whimsy year round. Known for its disease resistance, it is also adaptable to a variety of environments.